Watch as the innocent house fly sits unsuspecting while the mighty frog stalks its prey. Will his small size save his short life, or will the frog jump in to ruin his day? With a quick flick of his long tongue, the frog snatches up the fly to make him a gloriously satisfying entree. The poor fly no longer has any hope of buzzing away to land on some fresh droppings or picnic lunch somewhere. Now wake up, and realize that these are just mittens, and you have just spent too much time playing with your own hands to be considered sane. 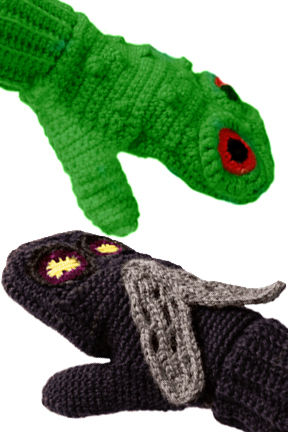 With this pair of predator versus prey mittens you encounter one of the most classic of all pairings. One hand is a tiny little house fly, and the other is a plump amphibian. 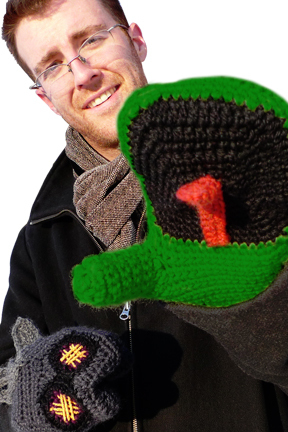 You probably won't be looked at like a normal person, but you will be sporting the most fun pair of mittens available. High quality wool, and close attention to detail allow these handmade mittens to look great and last a long time. These two creatures have been enemies since the beginning of time, so the battles are sure to be epic, which will lead to endless hours of enjoyment. Bundling up to protect yourself from cold weather has never been this much fun. With Vs. Mittens you will be preying for cold days, and upset when it gets too warm to wear them. 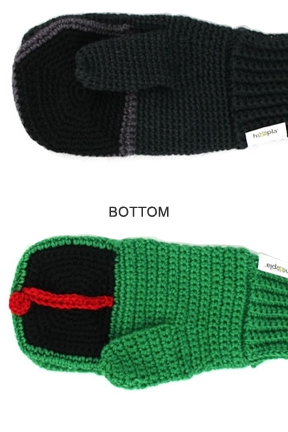 They work well as regular old mittens, and will keep your paws quite warm and extremely comfortable. In most cases, people will find themselves chomping, bashing, laughing and chasing more than anything, and the heat generated is more of an afterthought. Perfect as puppets or mittens, you will be able to act out your favorite National Geographic style scenes, or get all boring and just use them to protect your hands from cold weather. Find yourself deeply entrenched in an epic battle as you commute to work, or let the powerful frog help you bound up the stairs to your office. Amuse your friends and surprise unsuspecting strangers with these animal theme mittens. Kids love it when adults wear them, and adults who are kids at heart can't help but love them too. They add excitement and playfulness to an otherwise dull piece of clothing, plus they are high quality and nice and toasty when worn. You’ll love your Predator vs. Prey Frog and Fly Mittens so much you’ll be hopeful for snow, and happy when summer turns to fall. All Vs. Mittens are handmade and sweatshop-free. The fun characters and vivid coloration make them an attractive choice for anyone. Since they are so unique, they make the perfect gift for that person that has everything. Equally suited for both males and females, they feature a one size fits most sizing. The material is a blend of strictly regulated Australian wool and acrylic which allows them to stretch to fit somewhat, but also makes them comfy and cozy for those cold winter days. Love the concept, but not digging this version? Check out all of the other styles here: Vs. Mittens. These are for adults, but we offer styles for kids also. Order Yours Today! 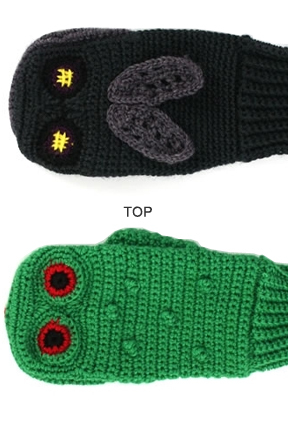 Predator Vs. Prey Mittens: Frog and Fly - Have fun and keep your digits warm at the same time. Don't let the cute frog fool you. If given a chance he will snap up the fly to make him lunch. This classic rivalry never gets old. Order Yours Today!